For Real Pickled Onion Lovers! Just a short 15 minute drive from Devonport, nestled behind beautifully landscaped gardens, encompassing lovely green pastures, you will find our Tasmanian Pickled Onion factory located at 100 Westella Drive, Ulverstone. Fresh onions specially grown on selected farms of the North West Coast of Tasmania are peeled and bottled in our factory. Stringent quality controls, committed personnel, pride and passion has led us to specialise in producing Tassie's tastiest pickled onion for everyone to enjoy. Tasmanian Pickled Onions Pty Ltd is a family owned/operated company with traditional values and a hands-on approach to every aspect of the business. We have been producing the finest quality pickled onions grown in Tasmania since 1999. Technical expertise, ability to diversify and willingness to meet the highest international standards are the principles on which the company was built and prospers. 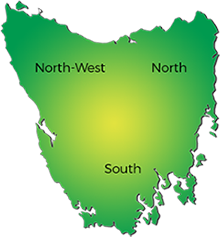 Tasmania has a reputation of growing the best quality onions due in part to the fertile, rich, red, volcanic soils and cool climate of our island State. Next years' onions are now planted and they will be graded in February. We use traditional methods, including hand-trimming the onions and we take enormous pride in carefully handling the produce to achieve the best quality pickled onions. Our own unique, bite size pickled onion. These delicious petite onions would ideally complement any gourmet or ploughman platter with an array of cheese and biscuits, coupled with your favourite choice of beverage! Our tasty traditional size onions would perfectly suit the catering style or larger functions – great for chopping, slicing or dicing! Also the ideal size For The Real Pickled Onions Lovers who just can’t get enough! Click on a region on the map to find stockists in that area, the list of stockists in that region will appear below the map. Our purpose built cafe & shop - Windows on Westella Cafe and Pickled Pantry - is now open to the public. Trading 7 days a week from 8.00am to 3.30pm our licenced premises offers a magnificent breakfast menu from 8.30am to 11.30am and a generous lunch menu from 11.30am to 2.30pm. We also offer all-day dining and take away options. While visiting take the time to browse our Pickled Pantry and check out our variety of Pickled Onions, various food lines and giftware. If you beleive there has been a privacy breach, please contact us through the contact details section of this website. When we receive your complaint, we will respond the allegation by requesting our Information Technology service providers to investigate and report to us any issues. We will then update you with any issues and how we intend to resolve these issues. If we do choose to transfer your information overseas (for example, by putting your name on Facebook or sending an email via Gmail), then we will ensure that the device or provider that will be storing your information will hold and use the information consistently with Australian law.